April 20, 2017 By This post may contain affiliate links. Believe me, it was the most scrumptious dessert I’ve ever created using a waffle. I love making waffle desserts. As a kid one of my absolute favorite treats to enjoy after school or swim team practice was an orange sherbet waffle sandwich. I’d take two toasted Eggo Buttermilk Waffles and sandwich orange sherbet in between them. The contrast of the warm crispy waffles with the chilly citrus sherbet was a winner in my book. I still enjoy that treat on occasion, but now as an adult I prefer something a bit more sumptuous. To make these dreamy Caramel Banana Waffle Desserts I took a Kellogg’s Eggo Thick & Fluffy Original Waffle and toasted it so that it’s crispy on the outside and light and tender on the inside then topped it with caramelized bananas, a Dulce de Leche (caramel) cheesecake mousse, a bit of whipped topping, and a chocolate dipped Eggo Minis Waffle. Decadent? Yes! Delicious? Of course! Wonderful? You bet! I just love waffles and could eat them for any meal. They really are a blank canvas on which you can create sweet and savory dishes. I grew up eating Eggo Waffles and still keep boxes of them in my freezer. They are so easy to prepare. 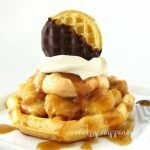 I just pop them into my toaster oven and in minutes I have crispy warm waffles that can simply be drizzled with syrup or can be turned into wonderful desserts like these Caramel Banana Waffles. 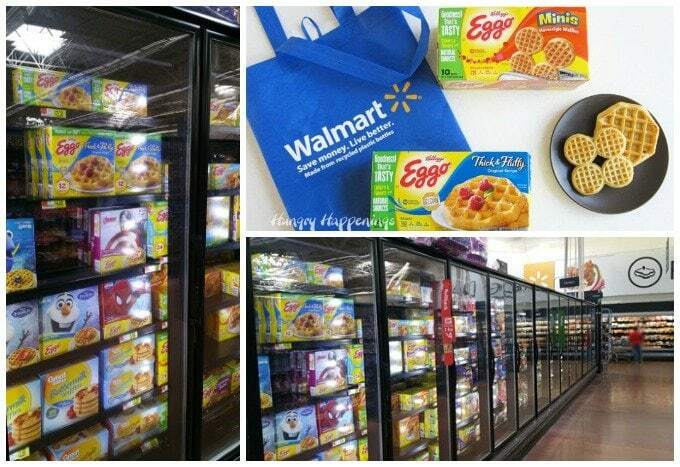 Eggo has so many different varieties of waffles to choose from including Buttermilk, Chocolatey Chip, Cinnamon Toast, Oats & Berries, Strawberry Shortcake and Blueberry Cobbler and they all now have colors and flavors from natural sources. You can find a huge selection in the freezer section at Walmart. While I was getting my waffles to make this dessert, I couldn’t help but throw a box of the Brown Sugar Cinnamon Roll waffles in my cart too. Guess what we’ll be having for breakfast this weekend? This dessert does require a few preparation steps, but none of them require a whole lot of time. 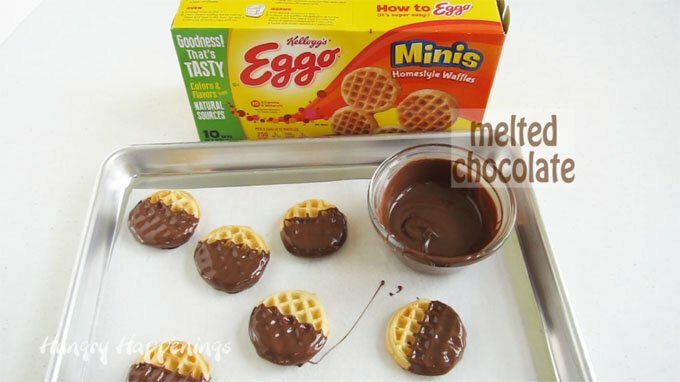 You want to start by dipping some Eggo Minis Waffles in chocolate. You can use pure chocolate or confectionery coating. Check out my Chocolate Making Tips tutorial for instructions on melting. Toast the waffles then allow them to cool to room temperature before dipping them in the chocolate. Chill until the chocolate hardens then set aside while making the mousse. To make the caramel cheesecake mousse you simply mix softened cream cheese with Dulce de Leche and whipped topping. If you’ve never had Dulce de Leche, it’s caramelized sweetened condensed milk that is available in cans or jars at the supermarket. It has a thick, silky texture and lovely caramel flavor and when mixed with cream cheese and whipped topping makes a luxurious caramel cheesecake mousse. The mousse would make a great waffle topping all on it’s own, but it’s even better topped with caramelized bananas. To make the caramelized bananas, start by melting butter and brown sugar until it caramelizes then toss in fresh slices of bananas along with a dash of orange juice. Cook the bananas until the sauce thickens and the bananas are well coated in the caramel. Depending on your stove and cookware this whole process can take between 5 to 10 minutes. While the bananas are cooking, pop all the waffles from an Eggo Thick & Fluffy Original Waffles, 6ct box in the toaster and heat until crisp. When the Eggo Waffles are toasted and the bananas are caramelized you are ready for assembly. Lay a waffle on a plate then spoon on 1/6th of the banana slices (1/2 of a banana). Scoop up some of the gooey caramel sauce and drizzle it over the waffle. Top the bananas with 1/6th of the caramel mousse then a dollop or swirl of whipped topping. To top off this decadent dessert, add one of the chocolate dipped Eggo Minis Waffles. Watch this video tutorial to see how easy they are to make. Toasted waffles topped with caramelized bananas, caramel mousse, whipped topping, and a chocolate dipped mini waffle. Toast the Eggo Minis Waffles. Dip about 3/4 of each waffle in melted chocolate. Set on a parchment or wax paper lined baking sheet. Refrigerate until the chocolate hardens, about 5 minutes. Beat together the softened cream cheese, Dulce de Leche, and whipped topping until creamy and smooth. Refrigerate until needed. Heat butter in a 12 inch skillet over medium heat until melted. Continue to cook without stirring until bubbling and caramelized, 3-4 minutes. 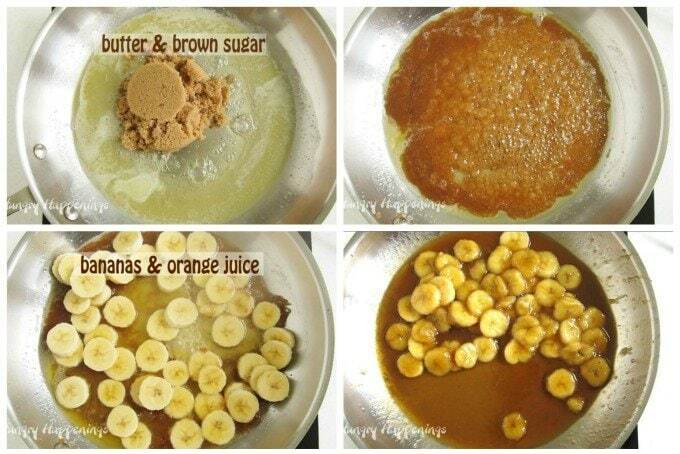 Add banana slices and orange juice. Stir until the orange juice incorporates into the caramel. Continue to cook for 2-4 minutes, tossing the bananas to coat, until the bananas are softened and browned slightly. Toast all 6 of the Eggo Thick & Fluffy Original Waffles. 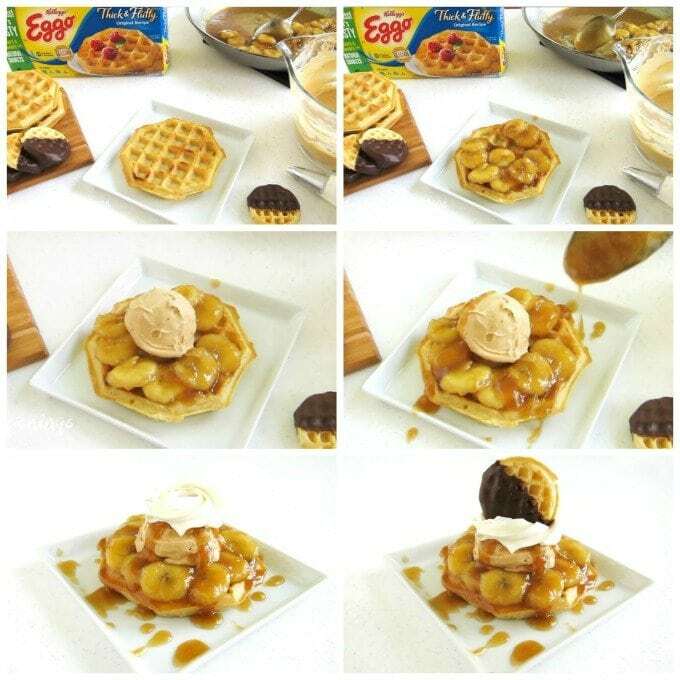 Set one waffle on each of six dessert plates then top each with 1/6th of the banana slices (1/2 of a banana). Drizzle on some of the caramel sauce. Add 1/6th of the caramel cheesecake mousse. Top with a dollop or pipe on a swirl of whipped topping. Set a chocolate dipped mini waffle on top and serve. I can’t wait to create more decadently topped Eggo waffle desserts. I’d love to hear how you turn your waffles into sweet treats in the comments below. 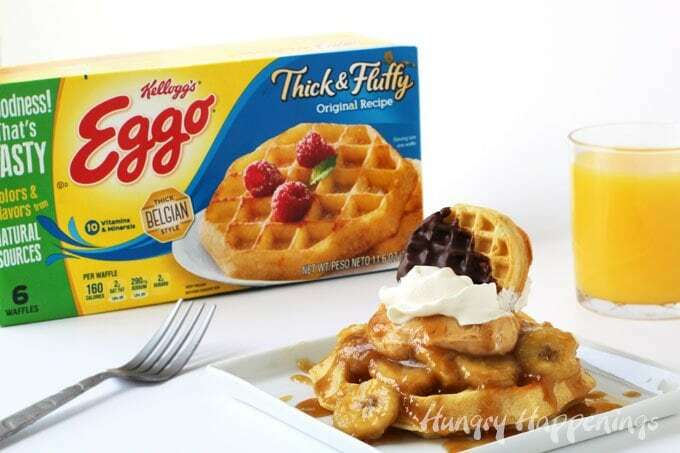 If you were to make a dessert topped Eggo Waffle, what would you like to top it with? That looks super yummy!! Thanks for the recipe, a definite keeper! Those caramelized bananas look delicious! Now it looks as though I could possibly have dessert for breakfast? Or actually anytime! I love caramelized bananas and think they definitely make this dessert one to savor!